EXPERIENCE 21st century fine-watchmaking. TYPE 3 is at the forefront of horological and micromechanical innovation - pushing the boundaries of traditional watchmaking. The TYPE 3 engages with physics like no watch before. The refraction of light as it moves from one substance to another - from air to sapphire crystal, for example - can distort perception. The TYPE 3 cancels this effect through its upper half being flooded with 35.7 ml of oil. The result is a new sense of clarity and immediacy, more, thanks to reduced friction, greater performance efficiency too. A new vision for fine watchmaking requires an original perspective and focused intent - that of industrial design. The TYPE 3 took years of meticulous research and development. It expresses both the tradition of watchmaking through its trailblazing patented ROCS - Ressence Orbital Convex System, and thanks to new micromechanical technologies such as a magnetic transmission, reinvents it. 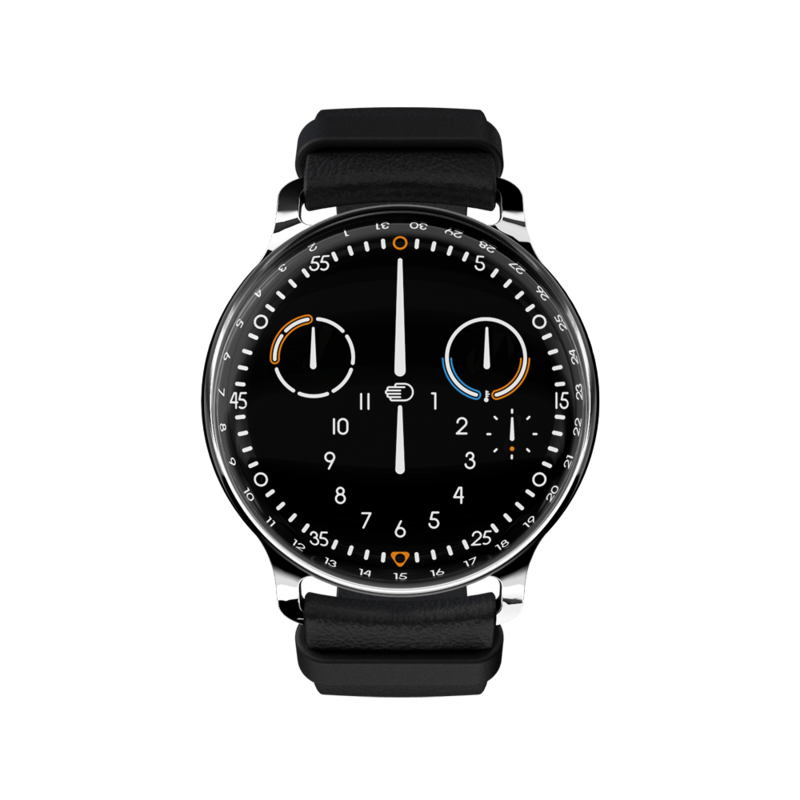 The aim of RESSENCE to express Time in the purest possible way started by replacing the conventional hands with rotating discs. Suspending them in fluids enhances our original concept as the whole watch becomes the Time itself. -An oil-filled upper half to allow legibility from every possible angle. -A magnetic transmission to connect the dry lower half - where the calibre is located - to the oil-filled upper half - where the ROCS is located. -Seven Bellows to compensate for oil volume changes due to temperature variations. The Japanese have a term for objects that appear simple overall but include subtle details that balance simplicity with complexity: SHIBUI. This balance of simplicity and complexity ensures that one does not tire of a TYPE 3 but constantly finds new meanings and enriched beauty that cause its aesthetic value to grow over the years. EachTYPE 3 is composed of 376 components carefully assembled by our master watchmakers. Rooted in industrial design, the TYPE 3 has been envisaged with the wearer in mind. The accent has been put on the comfort on the wrist with a light crownless 44mm grade 5 titanium case sandwiched by anti-reflective sapphire glasses. The TYPE 3 weighs barely 79 grams. We believe that displaying the time is essential to a watch. The readability of the TYPE 3 is therefore as simple and efficient during the day as during the night thanks to extra strong blue Superluminova. We took away the crown - totem of more traditional watch thinking - by reengineering the entire sapphire case-back as the means of winding and setting the dial. It allows us a more streamlined look and feel. TYPE 3 expresses all the curvaceous organicism of a pebble. It is as satisfying in the hand as it is on the wrist. The patented ROCS 3 is driven by the minute axle of a customized self-winding 2824/2 base calibre. Our "Ressence Orbital Convex System" is a state of the art horological complication module composed of 215 parts including the main and sub discs. 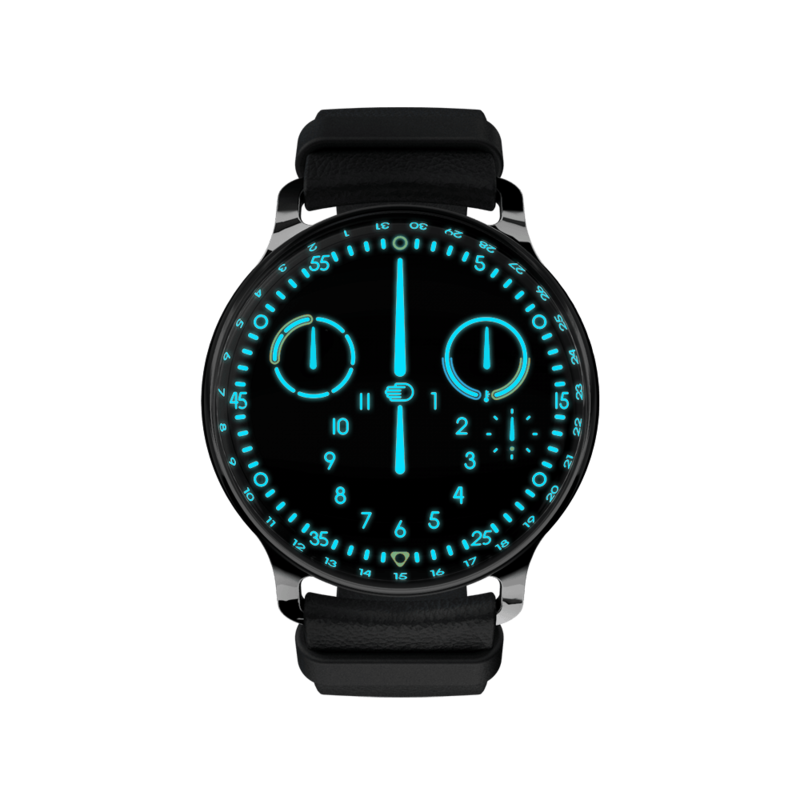 The result is a 3 dimensional dial entirely in motion and ever changing.